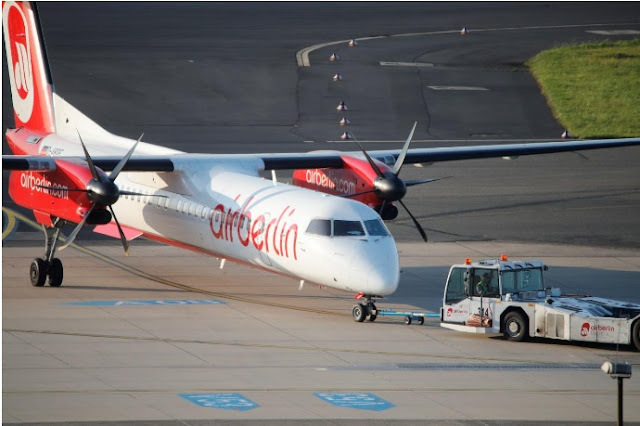 A Bombardier Dash 8 Q400 aircraft of German carrier AirBerlin is being towed at Duesseldorf airport, Germany. BERLIN - Lufthansa and several other parties have bid for parts of insolvent Air Berlin by a Friday deadline as administrators look for investors for Germany’s second largest airline. Air Berlin, which employs more than 8,000 people, filed for bankruptcy last month after major shareholder Etihad Airways withdrew funding following years of losses. Germany’s coalition government led by Chancellor Angela Merkel, who is seeking a fourth term in a federal election on Sept. 24, last month loaned Air Berlin 150 million euros ($179 million) to prevent its planes from being grounded. “The current status as of the 2 p.m. (1200 GMT) deadline today is that we have received several offers that we will now have to assess in great detail,” a spokesman for Air Berlin told Reuters TV, declining to provide further details. A source close to the negotiations said Friday’s deadline for bids was not set in stone and that any offers made over the coming days would still be taken into account. Most potential investors appear interested primarily in the airline’s roughly 140 aircraft and its airport landing and take-off slots rather than in taking over the business. Lufthansa made an offer for parts of Air Berlin, a spokesman said, declining to provide more detail. A source told Reuters Lufthansa planned to offer a three-digit million euro sum for up to 90 planes, including Austrian unit Niki’s fleet and 38 crewed planes it already leases from Air Berlin. Britain’s easyJet is interested in up to 40 planes, according to media reports. Former Formula One world champion Niki Lauda said he would put in a joint bid with German airline Condor, part of holiday firm Thomas Cook. Lauda has said he would make an offer worth around 100 million euros for Niki, an airline he once owned, and 17 Air Berlin aircraft. German family-owned logistics firm Zeitfracht said it had offered to buy Air Berlin’s cargo marketing platform, its maintenance business and regional unit LGW, which operates 20 Bombardier aircraft. Aviation investor Hans Rudolf Woehrl and China’s LinkGlobal Logistics have also expressed interest. German daily Handelsblatt reported on Thursday that the former head of utility EnBW, Utz Claassen, had put up 100 million euros to buy Air Berlin and had pledged an additional 600 million euros in liquidity. A final decision on buyers for the assets has been pushed back to Sept. 25, the day after Germany’s federal election and four days later than previously planned. German union Verdi, which among other represents cabin crew, criticized the decision by administrators to delay the announcement. “This postponement is at the expenses of the workers, who want a decision on their jobs and their future,” Verdi union board member Christine Behle said in a statement on Friday. Air Berlin was forced to cancel flights on two days this week after protesting pilots called in sick. Lufthansa and several other parties have bid for parts of insolvent Air Berlin by a Friday deadline as administrators look for investors for Germany’s second largest airline.